9mobile once made this as an offer for its subscribers during festive season some time ago, but today it has being official and you can enjoy live streaming and unlimited offer of 1GB for just #200 only. 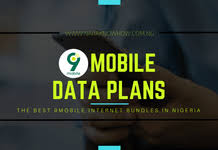 The validity period for the #200 data is three days but as soon as your run out of data, you can subscribe again, to the 5GB plan for just N1000 which has a validity period of 15days. Simply dial *929*10# to get activated and dial *228# for data balance. The plan works on all devices Android, Blackberry and iOS and does not require any special configuration and setup to start working. If your thinking my way, I think the grand master of data which happens to be Glo is kind of lagging behind, if this plan works perfectly and continually. All the same let us enjoy it while offer last.